Thermal Heating Services are friendly and helpful plumbers in Belmont serving the community for all their plumbing and heating needs. We are Gas Safe registered, fully qualified plumbers and heating engineers, available to service your boiler, repair and install new heating systems. Thermal Heating Services offer a wide range of plumbing services from fixing faulty plumbing and leaking taps to combi boiler installation. If you’re having trouble finding a reliable plumber, then look no further than Thermal Heating Services. Has your boiler become unreliable? If so, Thermal Heating Services can visit your property and inspect your boiler and fix the problem immediately if possible. We use all parts manufactured by the supplier of the boiler so you’re getting the exact part your boiler requires. Fixing a boiler is a complicated process and should not be tampered with as a DIY job. Always call a qualified plumber or gas engineer to repair or service your boiler to ensure it’s working to optimal standards and is safe to use. Our gas engineer is at hand to give your boiler the lease of life it’s never had before. We also carry out new boiler replacements, we supply and fit all our boilers to our customer’s specifications where possible. Upgrading your existing system could save you money on energy bills. We can even install heating systems in Belmont to a home that is still run on a traditional heating system. If your home only has a fire or storage heaters and needs a heating upgrade, we can lay all the pipework required for a central heating system installation. Upgrading your existing central heating system allows your home to be warmer in the winter and can help save money on your energy bills. Installing underfloor heating in Belmont is a relatively new process which is growing in popularity especially in properties struggling for room to fit radiators with a traditional central heating systems. By installing pipes into the floor of a home, the heat generated is allowed to rise from ground level. The modern underfloor heating solution is ideal for keeping your home warm at a consistent temperature and proves to be more energy efficient than most central heating systems. 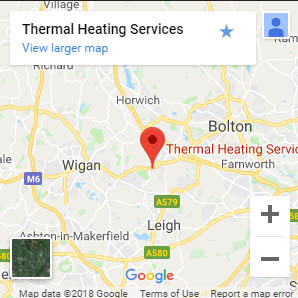 To find out more about our heating and boiler services, contact Thermal Heating Services today on 01204 776542 or email us via our contact form.